Unbeaten in seven regulation contests (6-0-1-0), the Soo Greyhounds return to home ice TONIGHT (7:07 PM) against the Kitchener Rangers. 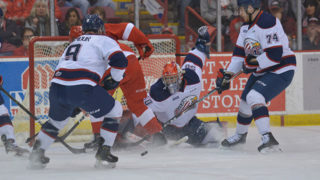 It will be the second meeting in less than a week between the pair of Western Conference clubs after the Hounds posted a 2-1 road victory last Sunday afternoon at the Memorial Auditorium. 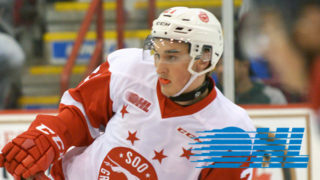 The Greyhounds are coming off a 6-3 home ice victory over Sarnia on Wednesday evening. BOBBY MACINTYRE’s 24th goal of the season at the 14:35 mark of the second period proved as the game-winner before he later added the insurance marker in the third. He was later named the game’s Red Star First Star. Tonight is the fourth and final meeting of the regular season between the Hounds and Rangers. 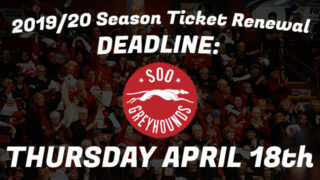 The Soo Greyhounds are now ten games above .500 inside the Essar Centre with a record of 19-9-2-1. Since a November 11th home ice loss to Saginaw back on November 11th the club has put together a 17-4-1-1 record in the Lock City. Kitchener is 4-5-0-1 in their last 10 on the road and an even .500 at 14-14-1-1 overall. 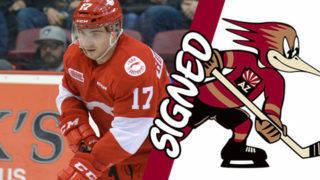 For the first time in 18 seasons, the Soo Greyhounds have a defenceman who has hit the 50 assist plateau. Not since Daniel Passero (98/99) has someone hit that mark with the club. CONOR TIMMINS did just that thanks to a helper on a MORGAN FROST goal at the 13:25 mark of the first period this past Wednesday Night. Timmins heads into action tonight with 6 goals and 51 assists, 57 points, and 6th on team scoring. The Rangers feature three overage players (’96 birth year) who tonight will skate in Sault Ste. Marie for the final time in a regular season. Forward Darby Llewellyn along with defencemen Dylan Di Perna and Frank Hora are in their final season in the Ontario Hockey League. 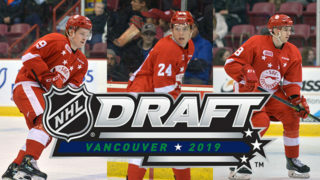 Llewellyn and Di Perna are in their fifth season of major junior hockey while Hora is skating in his 4th season. 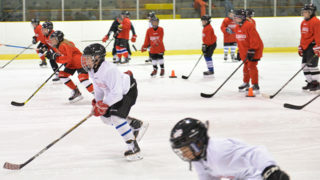 Both the Hounds and Rangers are amidst battles in their respective positions in the Western Conference. Having played 63 games each, the Hounds sit in 1st in the Conference, while the Rangers are in 6th. The Hounds hold a 6-point lead over the Windsor Spitfires meanwhile Kitchener is 2 points ahead of the Flint Firebirds. To view the complete conference standings CLICK HERE. GREAT seats for tonight’s game remain at the Essar Centre Box Office (beginning at 10:30 AM Friday), online at www.essarcentre.ca or by phone at 1.866.775.9422. ShawTV will bring the live action as well starting at 7:00 PM.